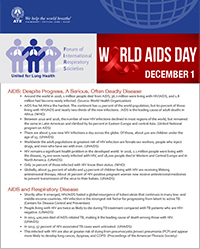 In recognition of World AIDS Day, held annually on Dec. 1 each year since 1988, the Forum of International Respiratory Societies (FIRS) is calling on governments, health advocates and non-government organizations to strengthen their response to HIV/AIDS. In 2016 AIDS claimed 1million lives. Read the press release.